The Hyundai Genesis 5.0 R-Spec gets a revised grille and a 5.0-liter V8 rated at 429 hp. CHICAGO -- Hyundai will pack more punch in its freshened 2012 Genesis sedan by adding a 5.0-liter V-8-powered R-Spec version to go on sale this summer. The Genesis R-Spec’s new V-8 has direct injection technology, 429 hp and 376 pounds-feet of torque. Fuel economy is estimated at 16 mpg in the city/25 highway. The engine is mated to a new eight-speed automatic transmission developed by Hyundai. The R-Spec version also gets 19-inch machine-finished rims and sport-tuned suspension and steering. The beefy V-8 engine helps boost Genesis performance to more closely compete with that of other luxury sport sedans such as the BMW 3 series, Mercedes C class and Audi A4, all of which outsell the Genesis. Hyundai showed the updated Genesis today at the Chicago Auto Show. The R-Spec version will cost between $45,000 and $50,000, making it the most expensive Genesis to date. The rest of Hyundai’s Genesis lineup is also getting upgraded for the model’s mid-cycle freshening. The 4.6-liter V-8 Genesis receives more power for 2012: 385 hp compared with the 375 hp made by the 4.6-liter engine in the 2011 Genesis. The 4.6-liter is also available with the new eight-speed automatic transmission. The 3.6-liter V-6 engine powering the entry-level Genesis gains gasoline direct injection technology for the 2012 model year. The technology helps to boost horsepower from 290 to 333 and torque from 264 pounds-feet to 291 pounds-feet. Outside, the 2012 Genesis also receives updated front and rear fascias and a new taillight design. Hyundai hopes the updates will help the Genesis maintain its sales momentum in the United States. January 2011 marked the car’s 19th straight month of year-over-year sales gains. 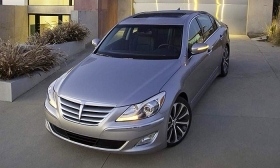 Hyundai sold 29,122 Genesis units in 2010, a 33 percent gain from 2009.